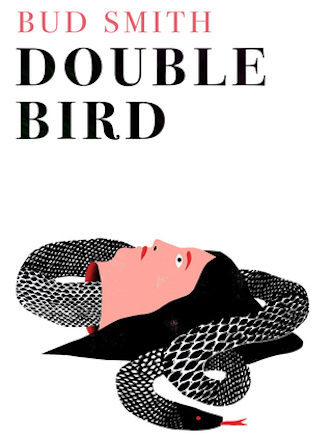 Double Bird is a collection of short stories, nearly flash fictions, about people you could easily find out there in the big bad world. And Smith’s easy, conversational style gives the illusion that these stories are true in some way, until it turns out that tiger blood is composed of actual tiny tigers and a guy digs up his dead brother for a chat and a dead fiancé has to give his approval before a wedding proposal and, oh hey, a whole other world underground where college degrees don’t matter and there are birds and furry creatures that might try to get your dog. The struggle is real, man. And in Bud Smith’s hands, it’s funnier than you’d think. There’s a real distrust of knowledge hiding in these pages. Knowing something, anything, is how the trouble begins. In “Agartha,” the story of a man fleeing the repo man with his dog, the narrator says, “Sometimes I think knowledge is just a weight that crushes a person. The more you know, the more the weight crushes down on you. It might save your life, but it also makes you miserable.” This coming from a guy who is told that his advanced degree is worthless in the new world he discovers underground. In “Birthday,” before Michelle’s giant hawk hatches from its egg and whisks her away from her miserable life, she says to her parents, “I never should have gone to college. What a dummy.” Later the hawk bites off her mom’s head and the dad comes looking for them in his helicopter; later, we find that Michelle’s parents had a helicopter parked in the front yard when she arrived. Smith is able to assemble such at first random-seeming observances in such a way they are not just left behind, but still somehow play out later, again and again to great effect. I was struck again and again by these types of observations in Double Bird. Smith really nails loneliness and the crippling doubt we as humans feel all the time. In “Random Balloons,” one of the most meandering stories in the book, we are hit hard in the final page with the thought that “everybody was a brand new isolated incident, estranged from even themselves.” As if Smith is taunting us. Can we really understand any of the characters in these stories if we can’t even understand ourselves?